When I was a kid I played with Barbie dolls, little plastic figurines that were supposed to simulate people in the “real world,” and I felt nothing odd about it. My sister owned a complete collection of the dolls, so there was more than just Barbie there. There were various configurations of feminine figures that had their own wardrobes, and a house, and vehicles. In fact, they made me feel jealous that I didn’t have complementary characters, but I wasn’t sold on Ken or his fellow plastic male models that were designed to take Barbie and her friends out on dates. I wanted a tougher man. Enter He-Man, Skeletor, and the Snake Mountain playset (complete with real microphone — batteries not included). I don’t even remember who got them for me, but I do recall the excitement I felt when I pried open the plastic packaging and extricated those heroes from their retail-ready cages. Finally I had real men who could ride in the Glam Convertible and look stylish next to Skipper, Kelly, and the gang of fashion-forward mavens. With their power of Greyskull they would magically create dream dates and interactions that would last a lifetime, or at least as long as the dolls held up. And they were good by themselves too. Having my own battles between good and evil was sheer excitement, creating scenes, more characters, and situations that would have been worthy of the television show. In fact, I would plot out dialogue between characters and write it down, hoping that one day I would submit it to the show’s writers, but that day never came because the show was eventually cancelled and I lost my chance. With that being said, maybe it was better that those situations stayed with me in my own bedroom because it makes them more special. Or something. 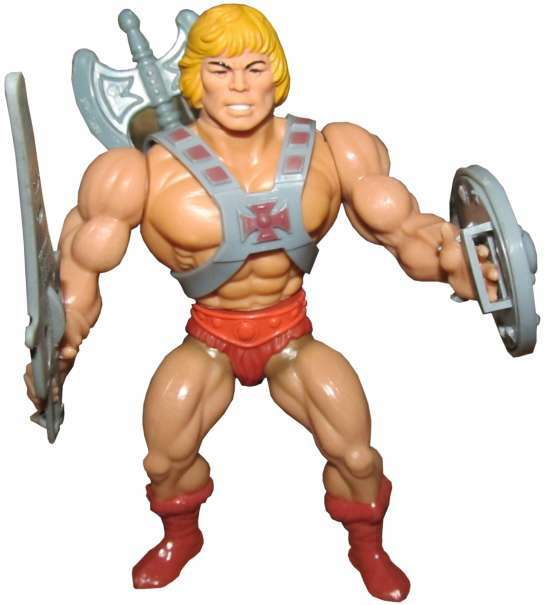 I loved He-Man not because he wasn’t Ken, or because he had a built-in suit of armor and a muscly exterior, but instead because he was the epitome of what the ladies always said was the “perfect man.” He had sparkling white teeth, was always honest, loved his sister (Go She-Ra! ), and fought against the bad guys. It helped that he also had magical powers and the power of Greyskull, whatever that was. I assumed it had something to do with him raising his sword because he always said his catchphrase whilst his sword was held high in the air above his head. It made me want a sword, but I probably would have stabbed myself with it. I loved He-Man because he looked good in Ken’s sunglasses, but he wasn’t full of himself. I wonder what he did in that castle alone all day when I went off to school. I think my uncle bought it for me because he felt sorry that I had to deal with so many Barbies all the time. I loved him for it. Toys are meant to me played with, and who are we to judge what our kids decide they’re comfortable playing with? Those Barbies were just as much mine as they were my sister’s and that was okay. She played with my He-Man just as much as I did too. And yes, Ram-Man was a human battering ram. I had him too at one point before he mysteriously disappeared.